WASHINGTON — Even though states have new flexibility under the Every Student Succeeds Act (ESSA) — the new federal education law that replaced the punitive No Child Left Behind (NCLB), which held states accountable for having all students proficient in reading and math by 2014 — their departments of education aren’t set up to take advantage of it. 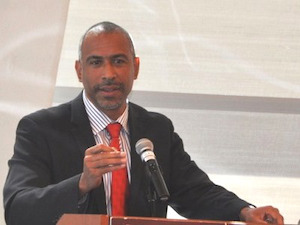 So argued Pedro Noguera, distinguished professor of education and director of the Center for the Study of School Transformation at UCLA, at the annual meeting of the American Educational Research Association (AERA), which drew a record crowd of more than 16,000 attendees. “Not a single state department of education in this country is oriented or knows how to help schools,” Noguera said. It so happens that U.S. Secretary of Education John King is expected to share his perspectives on ESSA implementation in states and school districts this Tuesday before the U.S. Senate Committee on Health, Education, Labor & Pensions. He criticized the Every Student Succeeds Act as “NCLB Lite” and said he found it interesting that that the American Federation of Teachers and the National Education Association had endorsed former Secretary of State Hillary Clinton without Clinton having released a clear education platform. “I often feel as though educators are like African-Americans to the Democratic Party,” Noguera said, criticizing them for their loyalty to Democrats and allowing Democrats to take their votes for granted without knowing what policies will be enacted. John Jackson, president and CEO of The Schott Foundation for Public Education, criticized the current testing regime as being wrongly focused on results instead of addressing the conditions that produce those results. Judith Browne-Dianis, a civil rights attorney and co-director of The Advancement Project — a Washington, D.C.-based civil rights organization that focuses combatting what it refers to as ‘inequitable’ policies — lamented that public education has not registered as a major topic in the 2016 presidential election. “One of the things that is most troubling to me is that, election cycle after election cycle, we are not talking about education as an issue,” Browne-Dianis said. But Jackson countered that the absence of public education from the presidential election is actually not such a bad thing because presidential politics would only politicize education issues at the expense of taking a careful look at the evidence on what really works. “The more political an issue in America, the less we pay attention to the evidence,” Jackson said. “And ideology trumps evidence every time in a political debate. The AREA annual meeting, which continues through Tuesday, touched on numerous topics in higher education, from racial conflict and hunger on campus to the best ways to engage formerly incarcerated individuals and children who grew up in foster care. Laura Rendon, a professor of educational leadership and policy studies at the University of Texas at San Antonio, said as a number of issues arise on campuses — from opiate use to guns on campus to new waves of immigrants from war-torn Syria — researchers should develop a “new scholarly imaginary” that may contravene traditional, Western ways of doing research. “We need to coin new terms,” Rendon said, relating that she is currently engaged in work that goes against the “deficiency framework” that has shaped the thinking around “low-income” and “first-generation” students. At the same time, Rendon said researchers must do more than just critique and contest existing research and research methods. “Research is not only about critique and contestation,” Rendon said. “Often times we get bogged down with that. Jamaal Abdul-Alim can be reached at dcwriter360@yahoo.com. Or you can follow him on Twitter @dcwriter360.